There are two fuse boxes, one below the dashboard and one under the bonnet. To access the fuses below the dashboard, pull back the access cover, undo the screws a quarter turn and tilt the whole unit. Before replacing a fuse, it is essential to find the cause of the incident and to rectify it. The fuse identification numbers are indicated inside the fuse box. 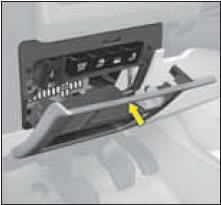 Use the special pliers A stowed on the cover close to the fuseboxes, this includes a compartment for replacement fuses. Your vehicle’s electrical system is designed to operate with standard or optional equipment. Before installing other electrical equipment or accessories in your vehicle, contact a CITROËN dealer. CITROËN will not accept responsability for the cost incurred in repairing your vehicle or for rectifying the malfunctions resulting from the installation of accessories not supplied and not recommended by CITROËN and not installed in accordance with its instructions, in particular when the consumption of all of the additional equipment connected exceeds 10 milliamperes.